The staff are super friendly, Rabah, Melody, Djenny, Stephane. They’ve made our stay very comfortable and feel like home. The rooms are spacious and clean, recently renovated and fully equipped. It’s right above the metro and near 3 supermarkets, bakeries, cafes, restaurants, shops and boutiques, and a 24 hour pharmacy. 10 minutes walk to the eiffel tour. If I ever come back to Paris, I will definitely stay here again. Location super convenient with subway just outside and grocery nearby. Eiffel tower view, friendly staff, good facilities including coffee machine at the lobby. Clean room, minibar and cooking facilities definitely a plus. The location is as good as it gets. There is a train station and a subway station within 200 feet of the hotel. The Eiffel Tower is less than a mile walk. We walked to the Champs Elysses, Louvre, Arc de Triumph and lots of great restaurants and bars. It's an awesome location. The view! I could lie on the bed and see the Eiffel Tower! Amazing! Overall the rooms were very comfortable. We traveled with our daughters, 7 and 3, and loved that there was a separate bedroom for us. They stayed on the pullout in the living area and were comfortable there. We also really appreciated that there was just a short walk to the metro station and a farmer's market every Sunday and Wednesday. The Monoprix (supermarket) was also very convenient to grab supplies for the kitchen (breakfast, snacks, etc.). The staff was also excellent and very helpful. Location, just next to train and supermarket. After bad experience with French transportation during the trip (flight strikes and cancelled) and no help provided from the Airline, We met one Thai staff who is very kind and helpful. This place is the last stop of the trip and it helps change our mind about French a lot. Location and facility were excellent! My only issue was that the hallways and elevators had a consistent smell of vinegar. 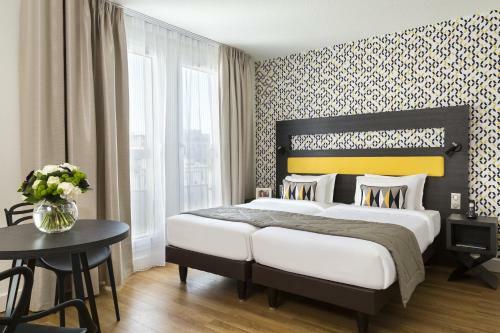 Lock in a great price for Citadines Tour Eiffel Paris – rated 8.2 by recent guests! 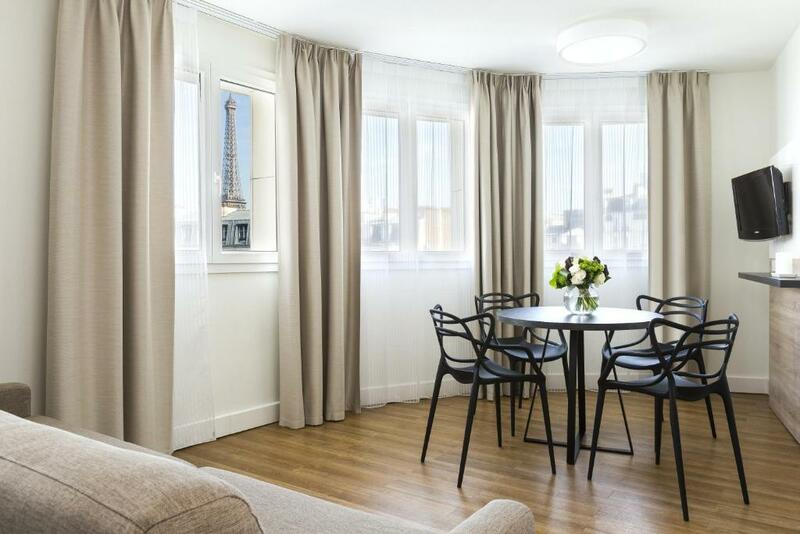 One of our top picks in Paris.Located a 15-minute walk from the Eiffel Tower, this residence offers stylish studios and apartments with garden views. It is next to the La Motte -Piquet-Grenelle Metro stop and offers free WiFi. 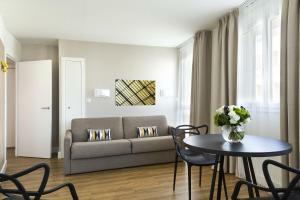 Citadines Tour Eiffel Paris is 2.9 mi from Parc des Princes Stadium. The air-conditioned apartments and studios at the Citadines Tour Eiffel Paris feature a flat-screen TV with satellite channels. They each have a kitchen with a dishwasher and a microwave. Breakfast is served everyday in the breakfast room. Facilities at the Citadines Tour Eiffel include private parking, a elevator and a 24-hour reception. A laundry and dry-cleaning service is also provided. Citadines Tour Eiffel Paris is a 20-minute walk from the Rodin Museum and a 15-minute walk from the Seine River. All of Paris’s attractions are easily accessible via the Metro. 뀐 Located in the top-rated area in Paris, this property has an excellent location score of 9.0! 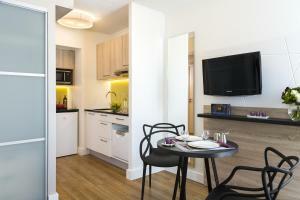 When would you like to stay at Citadines Tour Eiffel Paris? This air-conditioned studio features a contemporary-style decor, a satellite flat-screen TV (DVD player on request). The private bathroom comes with a bath and hairdryer. The open-plan kitchen is equipped with a dishwasher, refrigerator and microwave. Free WiFi access is provided. 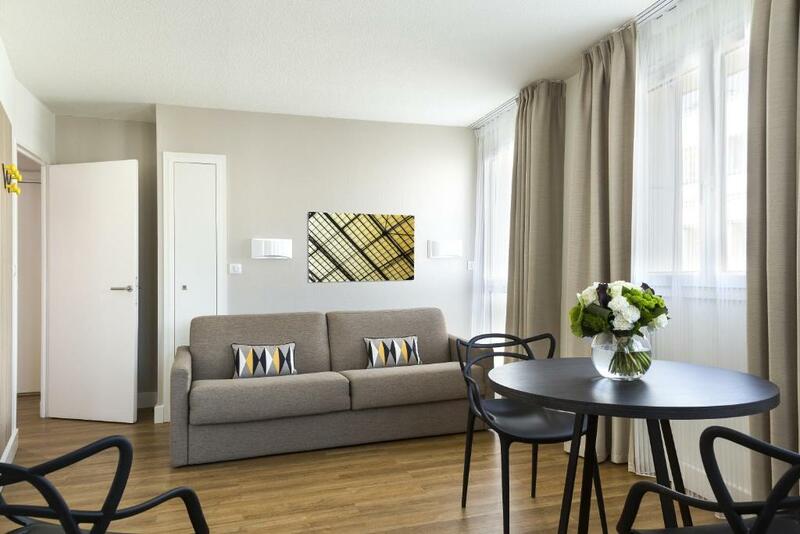 This air-conditioned apartment features a contemporary-style decor, a living room with a satellite flat-screen TV (DVD player available on request). The bathroom is fitted with a bath, hairdryer and free toiletries. The open-plan kitchen is fully equipped with a dishwasher, refrigerator and microwave. 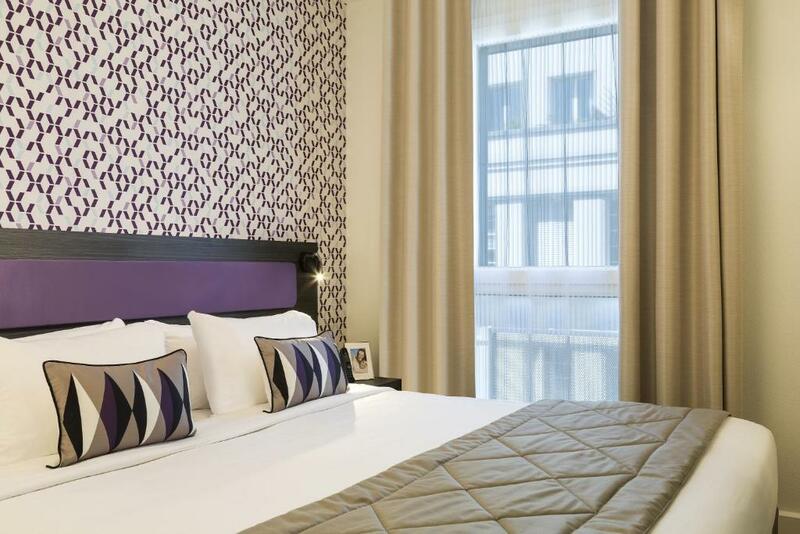 This deluxe air-conditioned studio offers views of the Eiffel Tower. It features a contemporary-style decor, a satellite flat-screen TV, free Wi-Fi access. The private bathroom comes with a bath and hairdryer. A proximité des étendues vertes du Champ de Mars très prisées par les Parisiens, et à l’ombre de la Tour Eiffel, votre appart hôtel jouit d’une situation tout à fait exceptionnelle dans l’un des quartiers les plus résidentiels de Paris. Au croisement du boulevard de Grenelle et de la très agréable rue du Commerce, vous voilà en plein cœur du village de Grenelle. Desservi par les lignes 6, 8 et 10 du métro, vous n’aurez aucune peine à arpenter la ville Lumière sous toutes ses coutures. Area Info – This neighborhood is a great choice for travelers interested in romance, tourist attractions and sightseeing – Check location Excellent location – show map Guests loved walking around the neighborhood! House Rules Citadines Tour Eiffel Paris takes special requests – add in the next step! Cash ANCV Chèques-Vacances Citadines Tour Eiffel Paris accepts these cards and reserves the right to temporarily hold an amount prior to arrival. Citadines Tour Eiffel Paris accepts these cards and reserves the right to temporarily hold an amount prior to arrival. Please note that guests will be asked to show the credit card used during the reservation upon arrival. For nonrefundable bookings, the guest must pay with his own credit card. If the credit card holder and the guest are not the same person, please contact the property in advance. Comfortable and clean. We could also see oart of the Eiffel tower from the room. Excellent location. - Room service available only for exta fees. - No porter to help with luggage during check in and out. - Great location. 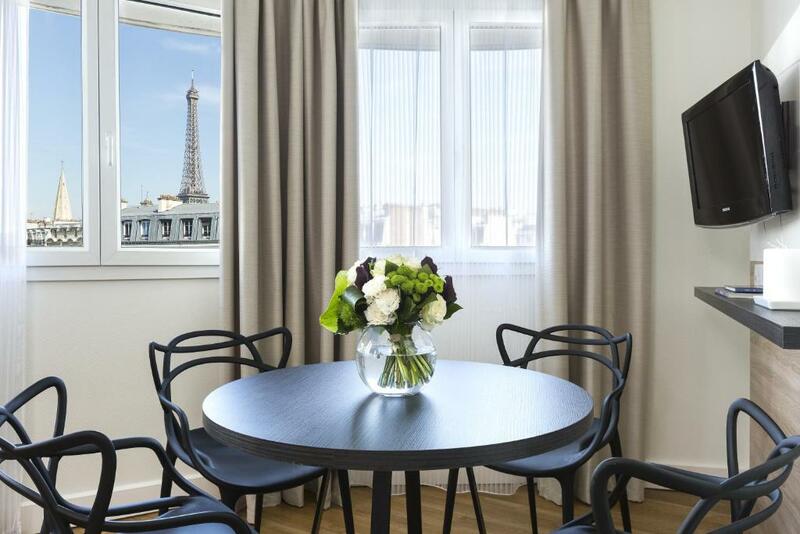 - Nice view for Eiffel tower ( Tower view studio) - Smooth check in and out. - Excellent kitchen . I prefer rooms with carpet on the floor instead of parquet especially under the bed. Some toiletries were not provided such as toothbrush and paste, comb, shaving razors, sewing kit, slippers. I thought the space was great and it had all the amenities and comforts of home. I loved the cleanliness and the staff was extremely helpful. Litter on street outside front door. Always enjoyable staying at Citadines. Will be back next year. We loved everything about this hotel. One word to sum up our stay PERFECT, the view PERFECT, the staff PERFECT, the facilities PERFECT. Looking forward to returning soon. The view of the Eiffle Tower was only a third of the tower because the upper levels were all booked (we were on 5th floor). But I was grateful to be in Paris with a chance to have a view of the Eiffle Tower. Was just disappointed it was not as advertised (they should put realistic photos amd expectations, because unless you are in "the" one suite you're not getting the view they advertised). I'm sure you can get a similar 1/3rd view of the Eiffle Tower somewhere else. Checking in took forever.. the lady was not unkind but she kept getting distracted, helping customers as they walked up to the desk instead of finishing with us first, the first and second time ok but by the third time I was frustrated. Room was dirty. Hair in the shower, overall did not feel clean, and smudge prints on the large glass window. If the view is a main attraction for your hotel, should clean the window. Comfortable place, compact, king sized bed, good free coffee. Right near the train so a bit noisy, but got used to it. Staff is terrible only mr ramy was nice. The rest didnt bother at all and didnt want to help much they are not bothered to do so. Noisy rooms, no cleaning included.. Most of the staff is terrible. Old looks old and has nothing to do with the pictures !